Is traveling on your list of New Years resolutions for 2017? If not, it should be! Travel market forecasts are showing that Asia and the Middle East are going to stay cheap, Europe and Latin America will get even cheaper, and even luxury destinations are offering great travel deals that will get people exploring their countries. Or maybe "travel more" was one of your travel resolutions last year, but it never quite happened (all of us are guilty of this!). Maybe you couldn't get the vacation time, or your friends bailed on the trip last minute, or you didn't commit to saving enough money. So 2016 passed by and you never ended up buying that plane ticket. Well, you're sure as hell buying it this year. I can't stress enough that you shouldn't wait to travel! Life is truly too short. You will not regret traveling more. We all know by now that people are happier when they spend their money on experiences, not things, so stop hesitating. And if you're not sure where to start, let me help you! 1. Pick a destination. I always start by figuring out which countries would be the cheapest to fly to. My favorite tool is Google Flights - just adjust the toggles to see which flights fit in your price range and watch all the routes come up! Or, pick a country that you have always wanted to go to and that you're comfortable with. Europe, Australia, and New Zealand may be less of a culture shock than South America or Southeast Asia. Being really excited about where you are going will help drive away any overwhelming anxieties and choosing a place that you feel is safe will help lessen those anxieties even further. Can't find any friends to go with you? Who cares! Go solo. I love traveling solo, and I promise you will learn more about yourself and the world by venturing out on your own. 2. Write it down. The day before I applied for the visa, I wrote in my journal – in all caps – I’M MOVING TO AUSTRALIA BY NOVEMBER 2016! I wrote it that way on purpose. Instead of writing, Oh, I really want to move to Australia or Wow, I really hope this works out and I get to move to Australia, I wrote it as though it was a done deal: I’m moving to Australia. I kept a lot of these affirmations in my journal, but you can put a post-it note on your bathroom mirror, keep it as a note in your iPhone, or write it in your planner so that you’ll see it everyday. Even better, make a graphic, post it on social media, and share your goal that way! 3. Visualize it. This looks different for everyone, but visualizing your goal and creating an inspiration board is something that has always worked for me. I cut out travel photos and quotes, then modge podge it all onto my journal. (Yes, I’m 26 and still decorate my journals.) But to me, that’s my inspriration board. 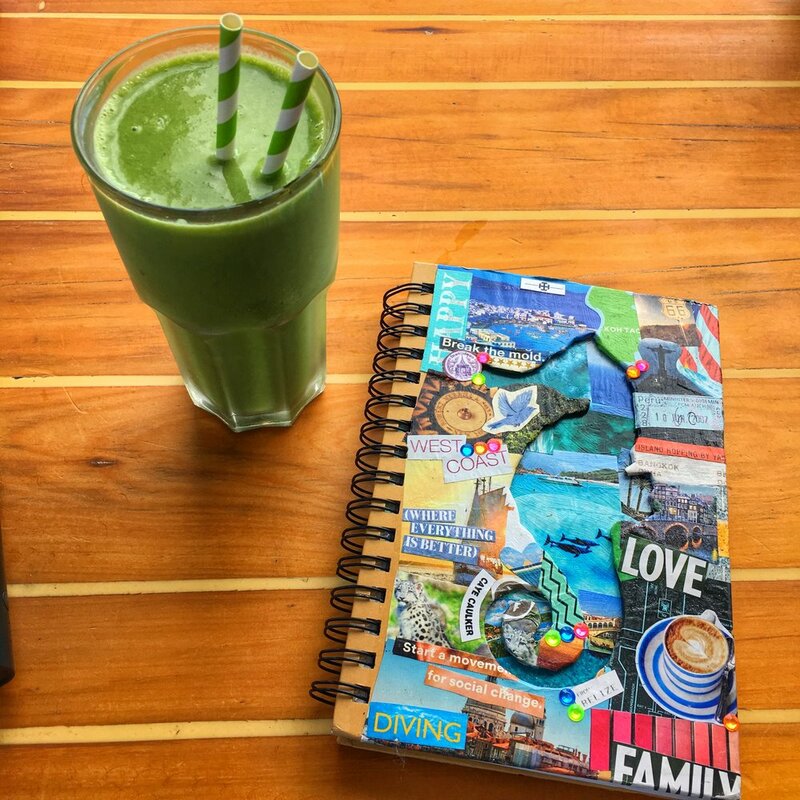 You can create an actual inspiration board for your room or start a Pinterest page where you collect travel tips and photos of where you want to go. I even changed my desktop photo on my laptop to my favorite photo of the Sydney Opera House. My goal was constantly in front of me; visualizing where you want to go is a powerful start. 4. Talk about it. I told strangers that I was moving to Australia. Just verbalizing and putting it out there was empowering. When I turned in my lease papers and told the apartment staff that I was moving out, they asked, “Oh, where are you going?” I took a deep breath and said, "Australia!” I just straight up told people that that was what I was doing and the more I talked about it, the harder it was to imagine backtracking or not going. Talking about your commitments makes it easier to keep those commitments. 5. Make a list. Now, I get that not everyone is as type A as I am and maybe I went a little overboard. But it helps to make a big to-do list (on paper, Evernote, OneNote, on anything) about what you need to do to make the trip happen. Then the fun part is crossing items off as you get closer to your trip! The items can be as small or as broad as you want, but some of them should be easy tasks as you work your way through the list. For example, want to go abroad but don't have a passport yet? Put that on the list! 6. Do the research. Are you going for one week or one month? Are you staying in hostels? What would a day-to-day budget look like? All this information is readily available on travel blogs by people who have taken the same path. Google is your friend here. A budget for Southeast Asia is going to look vastly different than a budget for Australia, and flight prices are going to vary based on if you're going during high season or low season. A good number to use is $50 a day for a backpacking budget, regardless of where you're going. 8. Surround yourself with positive people. When you start talking about your travel plans, whether it's a one week trip to Panama or a multi-month backpacking trip through Europe, most people will be very supportive and excited about your plans. Some people, however, will always be naysayers. Traveling is too expensive. Traveling is dangerous. Blah, blah, blah. Shake off the naysayers and minimize the time you spend with them, if necessary. You should fill your life with people who will support and believe in you, just as you would do for them. 9. Be patient. Some months you may be putting in $150 into your travel account, some months it might be $20. You might get nervous as your travel plans become more of a reality and start worrying about the logistics of the trip or all the things that could go wrong. You might have an unexpected cost, like new brakes for your car, that could set you back a bit. Be patient and be persistent. See your goal through, even if it takes longer than you think. 10. Buy the plane ticket. Book the rental car. However you're getting there, book it once you have enough money to pay for the flight. Then just keep saving money as your trip gets closer. Once you've got that ticket, you're not going back! It might be scary at first, but clicking that BOOK NOW button is the best thing you can do for yourself. I promise. The hardest part is committing to the plane ticket. After that, everything else will fall into place. Make 2017 yours. Go someplace new. Go abroad. Go by yourself. Go with friends. Just go. So, where will 2017 take you this year?! Like this blog post? Pin it!